Welcome to the ‘Essential China Travel Insights’ booklet page. Here you can find detailed information about the booklet, previous editions, articles, authors and much more. Deepen your knowledge on the Chinese travel market and read up on our latest news and insights, shared by our authors who are specialists of the industry. The booklet’s current ‘Dragon Edition 2012‘ has just been published and is available as a free eBook download. In Addition, you can also find out about our various cooperation opportunities for partnerships and sponsorships. 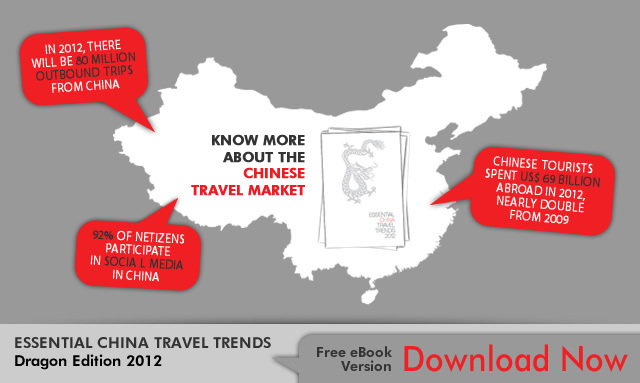 We hope you enjoy our latest China Travel Trends booklet!